I have had custom boots made for years costing several hundreds....this boots are great for the money. The width I could've went up a width but they are still comfortable to wear . These boots weere comfortable right out of the box. No pinching or rubbing and no blisters. They arrived very quickly and customer service was excellent. Great boots, customer service and quick shipping. Who can ask for more. I like the boot, under certain conditions the sole can be slippery. Comfort is good. The boot is waterproof and has toe protection. The boot does hold up well. The boot is available in wide widths. I have had three pair. I bought these for my son for his birthday. He has a hard time finding a work boot with some arch support. I found these boots and ordered them. An important factor was the removable foot bed. He absolutely loves these boots. He has worn then for several days and has said things like, "the only part of me which was not cold today was my feet." Or "I can walk all day in these boots and my feet never hurt or get tired." "this is the best birthday gift you ever got me." He does not need to replace the foot bed. I am ordering him an identical pair as a Christmas gift. Service was great from Shoeline. I’’ve posted on here before but these boots are so nice I gotta write again Got my first pair a little over a year ago. 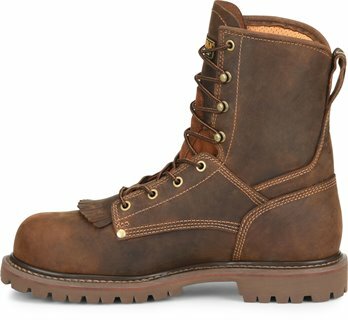 I’’m ordering a second pair only because the company I work for pays $100 for boots per year. I plan on using the pair I have now for atleast next 1-2 years. That would equal about 3 years worth of walking on concrete and still like new Using second pair as back up or at home. Next year at this time Ill b purchasing my 3rd pair. Nice and solid boot. Limited break-in time so it was comfortable within a short period of time. I’’d buy Carolina boots again very impressed especially considering the excellent price. Very fast shipping through Shoeline as well. Excellent boot. Im on my second pair...the first wore out on the inside the stitching finally gave way. Fit is excellent comfortable and take a lot of heavy wear. I wear them everyday and as a carpenter am very hard on boots. Ive worn many other brands and these are by far the best Ive ever owned. I would not write a review if I felt otherwise. Boots have minimal break in time. Comfortable for all day wear. They do look like they are wider then they are though. I’’ve been wearing the boots every day for a 12 to 14 hour workday. Comfortable right out of the box no break-in period. The boot fits great and feels great. Awesome boot. No break in time and very comfortable. Working on bridges all day is tough on boots so time will tell if the logger tread holds up. A good thick work sock and my feet dont move around at all. Being waterproof the boot is a tad warm so it may be uncomfortable when summer rolls around again. 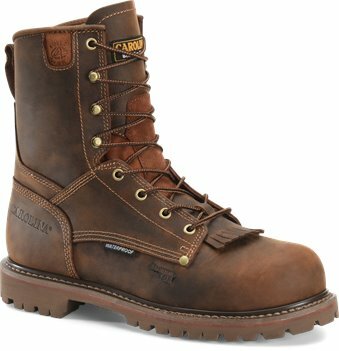 This is a very good work boot for the price. It is by far the most comfortable work boot I’’ve owned and I’’ve had plenty in the past 32 years. I have had some that were tougher but cost twice as much. I’’m getting my second pair now and plan to wear this same model as long as it is available.